It’s at this time of year that a full on burka makes sense to me. Christmas indulgence, sun and sleep deprivation, and cold weather make me want to bury my scaly skin and dry hair under a layer of clothes and hide away. Instead, I’m layering up with my own homemade blend of organic oils and upping my intake of good fats. 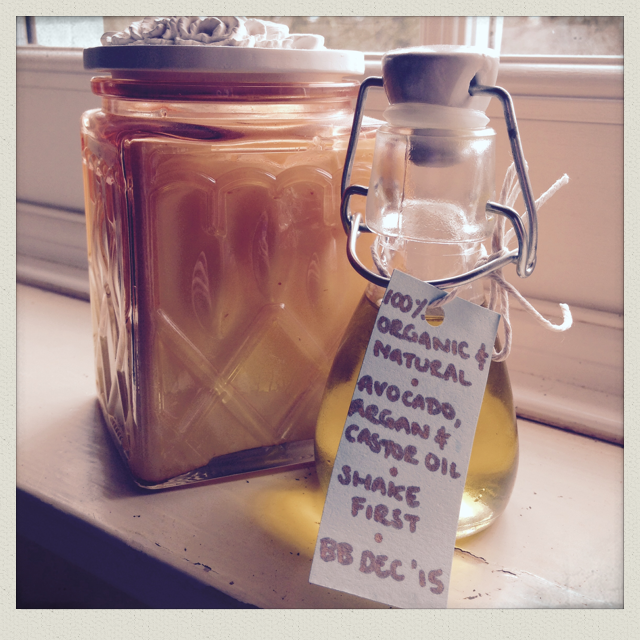 Below are details of a face oil which I made for the ladies in my family as a Christmas gift and it has been a hit! It’s especially targeted at ageing and dry skin but if you have oily skin just up the ratio of castor oil. You could also play around with different essential oils. Mix it up in a clean glass bottle and apply liberally. You can use this blend as a standard face oil, whether that’s to boost your moisturiser, for facial massage or as a night-time treatment. As it contains castor oil it is particularly suitable for the oil cleansing method (OCM). OCM is a way of cleansing the skin using oils instead of harsh facial washes and cleansers/toners. You simply massage the oil over your face (it will remove make-up including mascara!) and leave it for a minute or so. Then wash off with a very warm flannel. The oil will come away carrying all your skin’s dirt and grime with it. If your skin feels dry afterwards just rub a few drops of oil onto your face and neck and leave it to soak in. If face oils aren’t your thing then you could also use this on your body or as a pre-wash hair treatment. Castor oil is a carrier oil known for its anti-fungal and anti-bacterial properties, which is why it has earned itself a reputation as the mother of all skin oils. It’s skin balancing and protecting. You’ll even find it added to nappy rash creams! It’s always used in OCM blends but the quantity varies depending on skin type as, due to its antiseptic nature, it can be drying. I used about 30% castor oil, which makes this blend ideal for dry skins. Avocado oil is great for dry and ageing skins and packed full of vitamins A, B, D, and E, and essential fatty acids. I have added it for its skin rejuvenating and anti-ageing properties. Organic cold pressed avocado oil makes up roughly 35% of the Joli Naturellement blend. You’ve been living under a rock if you haven’t heard of argan oil! Over the last five years or so it has been hyped up as an anti-ageing miracle and you’ll find it has made its way into a whole host of everyday skin and hair products. Behind the hype are very high levels of vitamin E combined with its anti-oxidant and anti-inflammatory properties. It is particularly good for dry and ageing skins. It makes up approximately 35% of this blend. I’ve thrown a few drops of organic lavender essential oil into the mix (avoid if pregnant or breastfeeding). Unlike carrier oils, essential oils are incredibly concentrated (they’re not really oils at all) and a few drops are all that is needed to release their magic. Lavender is anti-fungal, anti-bacterial, anti-inflammatory and soothing. Obviously it costs more to buy all of these gorgeous oils in organic form so why bother? Everything we eat or use that isn’t certified organic contains residues of the pesticides or chemicals used to produce them (to a greater or lesser extent depending on what it is). I prefer, where possible, to avoid rubbing those nasties into my skin. Afterall, it’s our biggest organ! Use your oil within 12 months and shake it before each use. I’ve been using your oil for 4 months now and I love it. My skin looks refreshed and clean every time. I have dry skin so I use it as moisturizer every day and now I don’t feel that dryness in my skin nor it feels greasy either. So pleased you love it! I will make you some more for your birthday honey. Thanks for the lovely feedback.